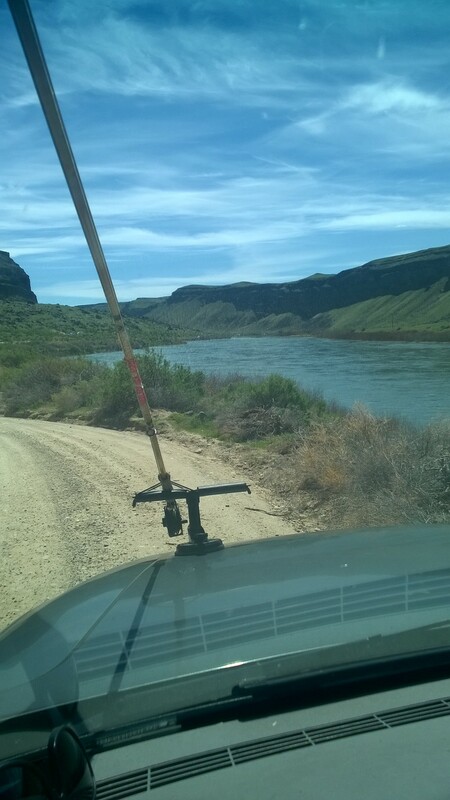 While contemplating my next fly fishing adventure I began to think that the Owyhee River would be a good bet. Last week I ventured to a cool little spring creek outside Hagerman Idaho called Riley Creek where I enjoyed casting to small rising wild rainbows during a Blue Winged Olive hatch. I always enjoy Riley Creek, it’s beautiful, wide, shallow and holds a lot of trout. It’s not the place you go for huge trout especially where I like to fish which is below the National Hatchery, but you can pick up a few nice sized trout on the creek over by the State Hatchery. So after watching all those small rainbows rising on Riley it’s only appropriate that I head to the “O” and rip a lip or two on some huge trout for a change of diet. However, there were quite a few reports coming in from the “O” that the fishing had slowed down and anglers where coming back with stories of no trout caught. I had two other cards to play; I could go on up to the Deadwood River which was flowing at 55 cfs or head out and fly fish the Snake River downstream from Swan Fall just south of Boise. The Snake River this time of year has always been my ace in the hole for catching lots of Smallmouth Bass. Historically this time of the year I can fish the Snake without seeing another fly angler for miles. I can catch lots of aggressive Smallmouths and even land a trout or two. The Deadwood Rive is about a week away from being a great place to fish especially with the addition of rainbows spawning up from the South Fork of the Payette. If you don’t mind driving about 20 minutes outside Garden Valley Idaho then it can be a good bet. The Deadwood Rive in the spring can be huge if your timing is right. Historically the Snake has been good to me and I haven’t fished the Snake this year yet so the Snake River won out. Saturday morning I woke up early and spent an hour or two getting my gear set up to fish for bass. Changing into a bass rod, switching spools to cast sink tip line and digging up all my bass fly boxes made the job a long one. At about 10 am I left for the river. As I got close to arriving at the river the scenery on the Snake River Plain is just beautiful to say the least. That scenery got my fishing blood boiling knowing I would see the river in just a few minutes. As I rounded the bend in the road and got my first view of the river my boiling blood became frozen. The Snake River was bank to bank, dirty and running fast. 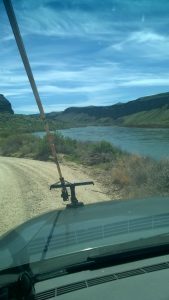 I drove the dirt road along the river to the end of the road and only identified two places where I had the slightest chance of making a decent cast. The problem was at these two places I only had about ten feet to fish. I just couldn’t get the right drift or the right cast. After trying for about 15 minutes at each spot I gave up. The Snake had stung me pretty good. Although I always check the river flows on a daily basis I let my confidence and history of fly fishing this river win me over. I didn’t catch any fish that day but like all fly fishermen we never stop learning. If I would simply check the river flows I would have chosen the Deadwood and probably done better. I’m not going to be like a lot of fly fishing bloggers who only tell you of their successes and talents. I instead will tell you about the days when I don’t do as well or the days when the trout school me instead of me them. I won’t give up on the Snake this year. I’ll be back, but I’ll be back when the wizard behind the curtain in the dam decides to drop the water flows to where I have half a chance. So I guess it’s back to the “O”. Tight lines…………………………. Idaho is arguably the best fly fishing state in America. Great destination rivers abound throughout the state of Idaho. The Henry’s Fork, South Fork of the Snake River, the many great rivers of Northern Idaho and the South Fork of the Boise River make Idaho stand out as a Mecca of fly fishing. Because of this, people from all over America come here to fly fish. Many people who have moved to Idaho are intrigued by the sport of fly fishing and soon want to learn. What most have discovered is there are more rivers and streams than they had previously realized and these waters are chalk full of wild trout. For those want to learn fly fishing, it becomes apparent that there is a lot of confusion surrounding the sport. Every person has an opinion, every fly fishing retail establishment has a system and the internet can be most confusing of all. Eventually it all becomes intimidating and learning how to fly fish is put on the back burner. As a full time fly fishing instructor who has fly fished for over 48 years I can see how fly fishing can be intimidating. When I first started fly fishing there was very little information available on the sport and most anglers taught themselves how to fly fish. Today fly fishing experts use the internet, social media and mountains of books and magazines to promote their opinions on how to fly fish. Mega fly fishing corporations are telling you if you want to be a successful fly angler you need to use their fly fishing products. Large retail giants selling fly fishing gear are telling you what gear you need to have and others are using your desire to learn fly fishing as a marketing tool to get you to buy their gear and after you have left with an arm full of gear you never hear from them again. When does the insanity stops? The truth is fly fishing is not complicated. In fact, it’s quite simple but being able to cut through all the confusion to see its simplicity can be difficult once you’re immersed in it. A few years ago I was fly fishing on the Madison River in Montana. It was one of those days when the fishing and the catching were in harmony. Suddenly out of nowhere came a loud voice screaming profanity that would make a sailor cringe. As I rounded a bend in the river I could see downriver a young man sitting on a rock trying to make sense out of a bird nest of knots that made up his leader. Surprised and somewhat embarrassed to see me his profanity was quickly corrected but I could tell from my distance that he was frustrated by what was once his leader. This poor angler eventually moved down the river and when I finally caught up to him he was sitting on a rock completely soaked after an apparent miscalculation with a rock landed him head over heels in the river. With water dripping off his nose he looked up at me and said “I quit, I just can’t get this fly fishing thing to work for me”. As a formal teacher of fly fishing for over 20 years I had noticed from a distance what the angler was doing wrong. He was simply trying to dry fly fish for trout that were not at the surface of the river but on the bottom. I gave him a quick remedy to try and went on my way. Later when I arrived at my truck I had another opportunity to speak with him. This time his attitude was one of triumph. He told me that after I left he not only caught a fish but spent the rest of his time on the water catching and releasing numerous trout. He thanked me and assured me that he would continue to give fly fishing a try. The birth of Northwest School of Fly Fishing can be traced back to an accumulation of frustration by many anglers like that one on the Madison River. For many fly anglers fly fishing has become both a passion and a pleasure to be enjoyed for the rest of their lives. It’s the goal of Northwest School of Fly Fishing to open that option to all who have that desire. Many fly fishing schools across America are sponsored by mega fly fishing corporations or have a famous fly angler’s name on the school. I wanted to start a school that welcomed everybody and offered classes at a fair price. I simply want to give all Idahoans the opportunity to fall in love with fly fishing. Northwest School of Fly Fishing is uniquely Idahoan. I know that we live in arguably the best fly fishing state in America. We are proud of our state and proud of our waters so we are not afraid to teach fly fishing from a leadership role. Because some accomplished angler who fishes a small limestone creek on the East coast believes fly fishing should be done a certain way to be successful doesn’t mean it applies to our big waters here in Idaho. So I see our school as a leader of cutting edge fly fishing and fly fishing instruction for Idaho and the Northwest. There are many beautiful and wondrous things that surround us in Idaho and we often take these things for granted. What we don’t take for granted at Northwest School of Fly Fishing is the proper way to learn fly fishing. It’s important that you to be successful on the water so we are keenly interested in how you are progressing after learning the basics. The need for a fly fishing school dedicated to the core fundamentals of fly fishing became apparent to me after years of teaching fly fishing to new anglers who themselves had been mislead in some way by the commercial end of fly fishing. Simple things such as learning what flies an angler needs to be successful were always ignored while the necessities of a quality reel took precedence. It doesn’t take a genius to figure out that a trout always prefers a good dry fly over that of a good fly reel. Examples such as these, positive encouragement from many fly anglers and the desire to make it right took me down the path to creating one of Idaho’s only independent fly fishing school. The first step in building a credible fly fishing school was to put together a fly fishing curriculum that encompasses every aspect of fly fishing. This means developing a class schedule that is attractive to those who want a beginning fly fishing course and advanced enough to make classes appealing to skilled anglers. The school also supports a seminar program. We bring in fly fishing experts present all fly anglers at every level of skill with continuing fly fishing education. To be a creditable fly fishing school it’s important to offer classes that also improve the skills of experienced fly anglers. It’s a given that in fly fishing you never stop learning and in my case I learn something new almost every time I go fishing. So really the bones of the Northwest School of Fly Fishing are in the quality, leading edge information and hands on approach to fly fishing that the curriculum is based on. But that’s not where it all ends. The future looks bright for Idaho’s own fly fishing school. Plans are on the board to expand the school to a place where anglers can go to study fly fishing. High on the list is building a library of up to date books on fly fishing, a map room, internet access, free fly tying and multiple class rooms. The goal of Northwest School of Fly Fishing is to create an atmosphere where fly fishing is always the topic of conversation and the free flow of information is always current.